Vehicles are engineered to remain upright on all four wheels even when moving at high rates of speed. Yet vehicle rollover accidents occur more often than most assume. If you have endured a rollover car accident or know someone who has been through such an ordeal, contact our car accident lawyers in New Mexico, Tennessee and Arizona right away. We know exactly how to litigate vehicle rollovers to maximize the odds for compensation for your medical bills, lost time at work, and pain and suffering. It is possible that a defective vehicle part played a role in the rollover. Or, the local government failed to keep the road in acceptable condition. Another driver’s carelessness can also result in your vehicle ending up flipped over. No matter what the cause, having a skilled attorney on your side to prove another party’s negligence will make all the difference in seeking compensation for your injuries and other damages. Your attorney will collect evidence, interview witnesses, and review video footage/pictures of the accident to firmly establish who was at-fault. Any person or institution found guilty of negligence will be held accountable for the part part they played in causing you harm and altering your life. 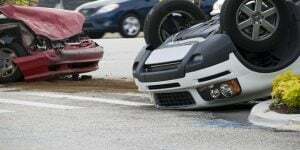 A rollover accident has the potential to alter your life for years or even decades to come. These types of accidents are often incredibly violent events in which everything and everyone in the vehicle flips upside down. Damage to the vehicle, yourself, passengers and nearby objects or people is a common occurrence. 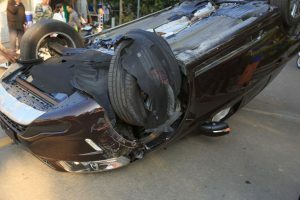 Examples of common injuries resulting from rollover accidents include broken bones, deep lacerations, internal organ damage, and traumatic brain injuries. Vehicle rollovers are incredibly serious accidents that demand the attention of a detail-oriented attorney with extensive experience. You should not accept any sort of settlement offer until thoroughly reviewed by such an attorney, like those at Lerner and Rowe Injury Attorneys. Let us review the facts of your case, develop the best possible legal strategy, and advocate for justice. We will represent you in a court of law, engage in settlement discussions, and also, greatly increase the odds of a substantial payout. Give us a call today toll-free at (844) 977-1900. We are open from 8 a.m. to 5 p.m. yet we will take your call 24/7. You can also get in touch with our team through our website’s LiveChat option, day or night.